When I first thought about growing a home garden I have to admit beets were not at the top of my list. Little did I know that when you grow your own beets there are many new varieties packed with flavors you won’t find at local markets or in a purchased can. 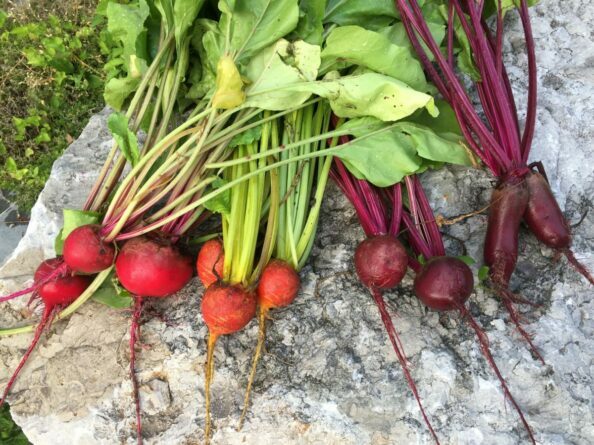 In today’s post we will research the different varieties to grow in home gardens, how to grow them, when to harvest and some awesome recipes to enjoy featuring beets. Below are images of the beets grown by friends of mine and in my own garden. This vegetable is loaded with great vitamins and are super easy to grow in most home gardens. Below is a list of varieties I find interesting and have grown or tasted at local farm events. Beets are grown from seed in the April Dome. I thought I was making a mistake when I grew my beets super close together in a large container in my geodesic bio dome this past spring but after making the recipe below I was totally wrong! Instead of throwing the beet leaves in the compost after realizing you should have thinned them so they had space to grow you can use the greens in this amazing recipe and serve them with your favorite meal. We served this beet green recipe up with fried chicken and it was amazing! Bring about 6 cups of water to boil in favorite stock pot with a dash of salt. Add clean beet greens to boiling water with salt. Cook uncovered for about 2 minutes or until tender. After draining beet leaves immediately immerse in ice water for several minutes until cold to stop the cooking process. Once the beet leaves are cold, drain well, and coarsely chop. Heat olive oil in a large frying skillet over medium heat. Add the garlic and red pepper flakes; cook and stir about 1 minute just to get that garlic and pepper flakes flavor going! Stir in the greens moving around getting it covered with the oil and garlic in skillet. Season with salt and pepper. Serve the 'greens' with lemon wedges and chickpeas for extra flavor. Roasted and tossed in a salad or pickled and enjoyed on its own: beets are a great way to add nutrient to your diet as shown in the chart below. Beets can be grown for a late Autumn harvest as well as in the Spring. Below Janet Cassidy used late harvest beets roasted and served for dinner. The gold beets I gave her from my garden during a visit. I have to admit I was having more fun growing them at the time then figuring out what to cook up with them. ‘Crispy and sweet, roasted beets are a quick side that pairs well with a variety of meats or as the star of a meatless meal’ shares Janet on her blog post featuring this roasted Beet Recipe. Janet also shared with me during the latest Spade to Spoon presentation that she pickles her beets in the Spring. Be sure to check out the great recipe for Pickled Beets . Every week Janet and I meet up to chat about what we are growing and harvesting. During today’s presentation, I was inspired to get more beet seed growing in my home garden even though it is early July. The Chioggia beet I’m growing only takes 55 days! I hope you will check out the presentation below and be sure to join us on Spade to Spoon this summer. 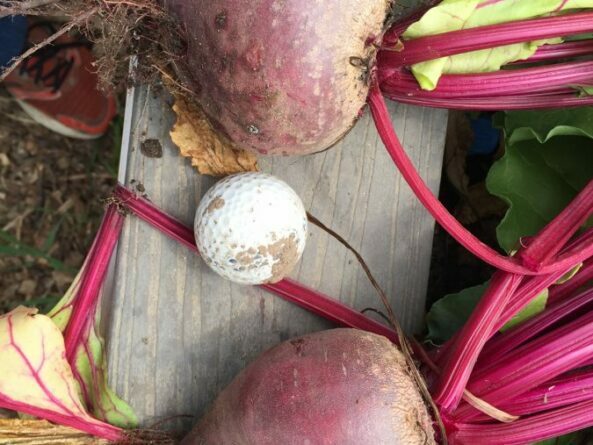 Have you ever grow beets? I’d love to hear what you enjoy to create as a meal using the beets so be sure to comment below. I also invite you to connect with me on my contact page on my contact page featured on this website.